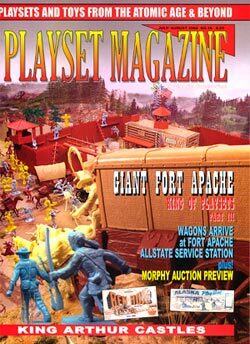 This issue we cover Fort Apache Part III, 1960 -1966,as two new styles of Wagons arrive at the Wild Wests Giant Fort Apache sets. These are the sets kids all over America had strong desires for, as they were jam-packed with extras, loaded with figures, additional walls and lots of accessories. Clearly, very few of us actually got them because they are now so scarce-- but you can see them in all their glory with EXTRA COLOR pages and in depth coverage. Next, browse a huge auction listing of playsets (4 pages of sets in COLOR!). Then to honor the new King Arthur movie, visit King Arthur's Castles. Our reviews cover Barzso's new 2nd Series Mexican Militia, Helen of Toy's first offering, and HaT's new Italians. Plus you'll find all the news, reviews, ads and classifieds you expect from a new issue. We hope you'll join us for all the fun and nostalgia!